House with : Ground floor: garage, entrance, storeroom. First floor : 3 bedrooms (3 double beds, 2 single beds, baby's bed on request). Toilet, bathroom (shower, bath, washing machine). Big living room and kitchen (50m2) with an access to a spacious terrace (25m2). At the back of the house: garden, courtyard and basketball. Boargames, table tennis and basketball are available. This house has a full equiped kitchen : dishwasher, over, microwave, gas cooker, fridge-freezer, scales, etc. Sheet are provided. Wi-Fi connection. Can’t thank Maurice and Monique enough. They made my kids happy!!! My two favourite French people. The accommodation is lovely, spacious and clean.there is a town with all the amenities 10 min away. There is go karting and a cinema too. A beautiful view and a river where you can fish and even swim. I extrongñy reccommend this property!!! 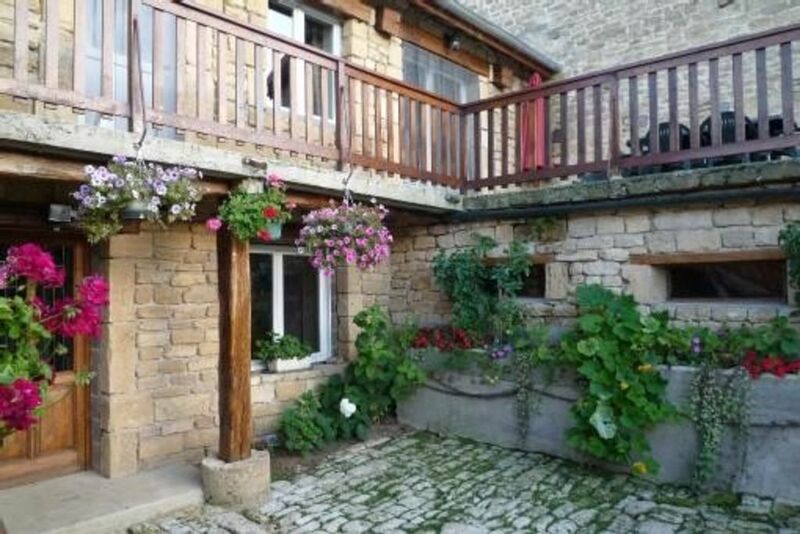 This is a delightful, comfortable and spacious property, well equipped. It is situated in a small village in pretty countryside, overlooking the owners' extensive smallholding. From the private terrace you look across a pristine vegetable patch, then past the geese, sheep, cows, rabbits, hens and doves to the hay meadows that lie between the woods on the hill beyond. Maurice and Monique are truly thoughtful, welcoming hosts. Autreville St Lambert is 8 km from the interesting medieval town of Mouzon, which has a beautiful riverside walk along the Meuse. Other places well worth a visit are Lac de Bairon at Le Chesne , 36 km via the scenic D30 and the interesting war memorials at Stonne, Charleville-Mézières (44 km) with its impressive town square and the attractive marina area at Stenay (11km). Lots of picturesque roads wending their way through pretty villages in gently rolling countryside. Had a great week in this charming gite in a very peaceful tiny village. The owers who live next door were very friendly and hospitable, adding to the holiday experience. Heerlijk , comfortabel , mooie omgeving , aardige verhuurders !! 19 , 16 , en 11 jaar , en Opa en Oma . zeer warm ( ook bij -7 ) , Schoon en een gezellige sfeervolle haard en een heerlijk bad !! Voor kerst kregen we van de eigenaar 2 stukken vlees , zo lekker en lief . en een groot pluspunt ….de wasmachine deed het niet bij ons , ….net op kerst avond, we wilde het toch melden ….hun vonden het zo rot voor ons ….binnen een uur stond de eigenaar er met een nieuwe wasmachine !! hij zei "Merry Christmas "....nou dat is nog eens mega top service ! We gaan er zeker een keer terug !! en we willen Maurice en Monique en de schoondochter SUPER bedanken voor deze mooie dagen !! Merci pour votre appréciation, nous sommes contents que le séjour vous ait plu. C'est avec plaisir que nous vous recevrons de nouveau. Très bonne adresse idéale pour visiter la région nord de la Meuse, à proximité de la Belgique voir du Luxembourg. Un accueil super sympa ! House in a little village with 40 inhabitants. Washhouses and fountains, Reims, capital of the Champagne (100 km), the basilica St Rémi, the cathedral Notre-Dame, palace of Tau, the museum of the abbey: all in the heritage of UNESCO. And of numerous strolls and gone hiking around.